Various diseases often result in decompensation requiring resuscitation. In infantsmoderate hypoxia evokes a compensatory augmented breath – sigh and more severehypoxia results in a solitary gasp. Progressive asphyxia provokes gasping respirationsaving the healthy infant – autoresuscitation by gasping. A neonate with suddeninfant death syndrome, however, usually will not survive. Our systematic research inanimals indicated that airway reflexes have similar resuscitation potential asgasping respiration. Nasopharyngeal stimulation in cats and most mammals evokes theaspiration reflex, characterized by spasmodic inspiration followed by passiveexpiration. On the contrary, expiration reflex from the larynx, or cough reflex fromthe pharynx and lower airways manifest by a forced expiration, which in cough ispreceded by deep inspiration. These reflexes of distinct character activate thebrainstem rhythm generators for inspiration and expiration strongly, but differently.They secondarily modulate the control mechanisms of various vital functions of theorganism. During severe asphyxia the progressive respiratory insufficiency may inducea life-threatening cardio-respiratory failure. The sniff- and gasp-like aspirationreflex and similar spasmodic inspirations, accompanied by strong sympatho-adrenergicactivation, can interrupt a severe asphyxia and reverse the developing dangerouscardiovascular and vasomotor dysfunctions, threatening with imminent loss ofconsciousness and death. During progressive asphyxia the reversal of graduallydeveloping bradycardia and excessive hypotension by airway reflexes starts withreflex tachycardia and vasoconstriction, resulting in prompt hypertensive reaction,followed by renewal of cortical activity and gradual normalization of breathing. Acombination of the aspiration reflex supporting venous return and the expiration orcough reflex increasing the cerebral perfusion by strong expirations, provides apowerful resuscitation and autoresuscitation potential, proved in animal experiments.They represent a simple but unique model tested in animal experiments. Breathing can be frequently modified reflexly or voluntarily. According to time andintensity characteristics, the modifications of breathing can be well assessed byrecording of electromyogram (EMG) of inspiratory and expiratory muscles and airflow, aswell as the activity of afferent and efferent nerves and their central structures.Monitoring of breathing and other physiological parameters in infants indicated thatapnoeic episodes and occasional occlusion of the face-mask outlet evoke 4 differenttypes of reaction. They depend mostly on the intensity of the resulting hypoxaemia andhypercapnia, as well as on the maturity of the infants’ cardio-respiratory controlmechanisms. Polysomnography in healthy infants during sleep indicated, that anoccasional airway occlusion, causing hypoxia usually evoked a startle reaction,accompanied by limb and nuchal EMG activation, neck extension, and heart rate (HR)acceleration. There was a simultaneous large biphasic inspiratory effort - augmentedbreath or sigh, where the intensity of startle correlated with the magnitude ofmaximal negative airway pressure and HR acceleration. These results indicate that theaugmented part of sigh coincided with the genio-glossal (GG) muscle activation,resulting in frequent opening of airway closure with only brainstem or sub-corticalmechanism, but without cortical involvement. More severe hypoxia results in asolitary gasp. These reactions improved with age and were not caused bystimulation of stretch receptors due to lung inflation [1–3]. Gasp as a primitive form of breathing develops during the foetal life in mammals. As thefirst breaths after birth connected with hypoxia, sighs and solitary gasps tend todistend the atelectatic alveoli, contributing to a gradual distension of the lungs innewborns. Stronger and longer-lasting asphyxia after reconfiguration of thecardio-respiratory control mechanisms provokes development of gaspingrespiration. This is characterized already by markedly depressed brain functionwith flat electroencephalogram (EEG), suppressed peripheral reflexes and muscularatonia. Gasping respiration develops often before death as a last resort, tending torestore the failing vital functions and to resuscitate the mammals -autoresuscitation by gasping[4–9]. This autoresuscitation mechanism maybe unsuccessful in excessive and long-term asphyxia, or in babies with under-developedcardio-respiratory control mechanisms. Such a failure may occur particularly during thefirst months after birth, often resulting in silent death (Figure 1). Therefore, the explanation of the mechanisms of autoresuscitationby gasping appeared to be extremely important, particularly in infants. Autoresuscitation by gasping in healthy infant and its failure in neonate withSIDS. In a normal infant an inhalation of lower O2 and/or higherCO2 content in air evokes hypoxia with occurrence of solitary sighsor gasps. The sigh is accompanied by a startle reaction, which manifests with neckextension and upper airway dilation, resulting in normalization of breathing.Severe hypoxia provokes solitary gasps accompanied by cortical arousal andmovements. Progressive asphyxia provokes a period of gasping respirationcontributing to autoresuscitation by gasping. Similar asphyxia in a risky pretermbaby (including SIDS during a critical period after birth), does not evokesolitary sighs with startle or gasps, but results in silent death. Reproduced withpermission and modified from . Gasping respiration is a critical mechanism for survival and it serves forautoresuscitation in all mammalian species from the day of birth, when eupnoea fails.Autoresuscitation by gasping represents a very effective life-saving mechanism fromsevere cardio-respiratory failure, accompanied by deep coma. The effects of thisprimitive type of breathing were tested in experimental models in pigs, cats andother animals. Piglets were studied to determine the cardiovascular andneuro-physiological effects of prolonged laryngeal-induced respiratory inhibition.During continuous laryngeal stimulation in light anaesthesia the EEG becames flat by1 min after the onset of apnoea and remained iso-electric throughout thestimulation period. Apnoea was interrupted every 1–2.5 min by clusters of2–6 gasp-like breaths. With each cluster of gasps, arterial PO2 andmean blood pressure (BP) increased. These data indicated that despite EEG silence,piglets can autoresuscitate from asphyxia by initiating gasping, whichmay markedly improve the cardiovascular status, and sustain animals for a prolongedperiod of time . In animal study withuntreated experimental ventricular fibrillation (VF) and postponed defibrillation,gasping developed gradually during 4–6 minutes, transiently providingsufficient venous return of blood to the heart and a continual perfusion of the brainand other vital organs. In such a manner gasping respiration provided cardiacoutput during cardiac arrest and saved certain animals according to thereserves of their vital functions . Many mammals are born immature and in addition to retardation in physical andmusculoskeletal growth, several patho-physiological defects including thecardio-respiratory responses to hypoxia and hypothermia may also occur. In an invitro preparation, endogenous 5-hydroxy tryptamine (5-HT) is reported to be essentialfor expression of gasping. Using an in situ preparation of the Pet-1 knockout mouse,the number of 5-HT neurons is reduced by 85-90% compared with animals without thishomozygous genetic defect. Despite this reduction in the number of serotoninergicneurons, phrenic discharge in eupnoea and gasping of Pet-1 knockout mice was notdifferent from that of wild-type mice. Gasping continued unabated, even afteradministration of methysergide, a blocker of many types of receptors for 5-HT,indicating independence of gasping on levels of serotonin . On the other side, HR recovery failed at a critical agein 5 HT deficient mice exposed to episodic anoxia . The neuro-genesis of gasping is dependent on the discharge of neurons in therostro-ventral medulla, overlapping “the pre-Bötzinger complex”(preBötC). Neuronal activities of this complex, characterized in an in vitrobrainstem-spinal cord preparation of the neonatal rat, have been hypothesized tounderlie respiratory rhythm generation. The rhythmic activity of this in vitropreparation is markedly different from eupnoea, but identical with gasping in vivo.Medullary neuronal activities generating the gasp and the identical rhythm of the invitro preparation are incorporated into the ponto-medullary circuit definingventilatory activity . EMG activity of upper airway (UA) genio-glossal muscle -GG and the diaphragm (D) werestudied in anaesthetized rabbits during progressive asphyxia induced by airwayocclusion. Peak activity of GG increased more than that of the D during hyperpnoeaand gasping. These data indicate differences in the control mechanism of the GG and Dduring acute severe asphyxia. Increased UA muscle activity seen during gasping shouldhelp preserve UA patency, and facilitate autoresuscitation by gasping. Theseobservations support the concept that gasping is a highly organized function ofthe respiratory center[14, 15]. During severe hypoxia the network properties within thepreBötC are reconfigured, whereby it no longer generates eupnoea, but insteadgenerates gasping. Such reconfiguration includes changes in synaptic and intrinsicproperties triggered by hypoxia itself, as well as the influence of differentneuromodulators released during hypoxia. Therefore, gasping respiration has beenconsidered an important mechanism, that triggers autoresuscitation. Deregulation ofgasping has been proposed to result in failure to autoresuscitate and has beenhypothesized to contribute to development of SIDS [7, 8]. Precisely which synaptic and/orneuronal intrinsic membrane properties are critical to central respiratoryrhythmogenesis, in either normoxia or hypoxia, is still the subject of considerablediscussion [13–16]. From several reflexes evoked by stimulation of various areas of the airways, thefollowing three, illustrated in Figure 2, are especiallyimportant for the protection and defence of the respiratory system. A gasp-likeaspiration reflex (AspR) can be regularly evoked by various mechanical,electrical, and other methods of stimulation of the nasopharynx (NPh) in bothanaesthetized and non-anaesthetized cats and other mammals. It manifests as asolitary spasmodic inspiration (SI) that only lasts for 150–230 ms, andfor its tendency to inhibit expiratory efforts it is usually not followed by animmediate active expiration [17–21]. However, the irritant substances may be transported bythe rapid and strong inspiratory airflow, and a muco-ciliary transport from NPh tothe hypopharynx, from where they may provoke reflex swallowing or cough. Accidentalinput of irritants into the larynx usually provokes laryngo-constriction and theexpiration reflex (ExpR) or a prompt cough reflex (CR),providing expulsion of irritants, and so preventing their aspiration into the lungs. The tendency to provoke SIs ishigh at the beginning of spontaneous inspiration for ventilatory drive, but itgradually decreases during the inspiratory phase . The AspR can be induced also by negative or positivepressure air puff stimulation of the upper airways . In paralyzed cats, stimulation of the „irritant”rapidly adapting receptors (RARs) of the NPh by mechanical contacts and pressurepulses or air-puffs provokes a very strong activity in the glossopharyngeal afferentfibers, resulting in AspR. The frequency of afferent impulses is very high (mean197/s, range 67-330/s) , which is >10times higher than during control inspiration. They strongly activate many brainsteminspiratory neurons, including “the inspiratory pattern generator”,described in the brainstem of juvenile rats , and the respiratory central pattern generator (CPG), wasanalyzed more in detail in several papers [12, 27, 28]. Strong activation ofvarious inspiratory neurons of adult cats by AspR was identified by c-Fosimmuno-reactive method in 14 of 35 tested brainstem nuclei . Schematic presentation of the main protective and defensive reflexes incats. Airflow record (V’) with inspiration downward (↓).Stimulation of specific airway areas using mechanical contacts with a nylonfiber (-----) and presentation of odorous substances(□□□) are indicated in anaesthetized cat. Inaddition to gasp- and sniff-like aspiration reflex elicited from thenasopharynx, sniffing from the upper part of nasal cavity, expiration reflexfrom the larynx, the cough reflex from the trachea-bronchial region andsneezing from the nasal mucosa. Modified from our earlier publications[22, 31, 40]. The AspR is characterized by a specific time-frequency distributionof powerful energy in the phrenic nerve, manifesting with high frequency oscillations. Such powerful activation of the“presupposed inspiratory generator” by the AspR  can very effectively modify (facilitate or inhibit throughdense synaptic connections  and severalmediators the “central mechanisms” of various vital functions. Recording and power spectralanalysis of the phrenic and the hypoglossal nerve activities in paralyzed cats,indicated very similar character and peaks during both the hypoxic medullary gaspingand the AspR evoked by mechanical stimulation of NPh in normoxic conditions[33, 34]. Suchclose similarity of AspR with gasping suggests their similar resuscitation potential,resembling autoresuscitation of human infants by gasping [4, 5, 7]. Greatsimilarity and vitality of AspR with gasping was supported by its persistence at theabsence of CR and ExpR in premortal gasping stage after medullary transsection5 mm above the obex in cats ,fitting the localization of “inspiratory generator”. The resuscitationpotential of AspR was proved by termination of progressive hypotension andatrio-ventricular (A-V) blockade in a cat, during gasping stage caused by severeasphyxia, indicated on Figure 3, analyzed later more indetail. Similar gasp-like inspirations were elicited by mechanical stimulation of NPhalso in adult rats , dogs  and premature infants , as well as by inflation of the whole respiratory systemalso in newborn babies . Such approvedsimilarity of gasp-like AspR in cats and other animals, with the gasping in infantssuggests also similar resuscitation potential for AspR in cats and other animals,than gasping in human infants. It allows also a hypothesis that normalization orresuscitation and even autoresuscitation potential of airway reflexes may exist inhumans, which was supported by reversal of various functional disorders using airwayreflexes in men . Cardio-respiratory failure in anaesthetized cat during asphyxia andresuscitation by AspR. 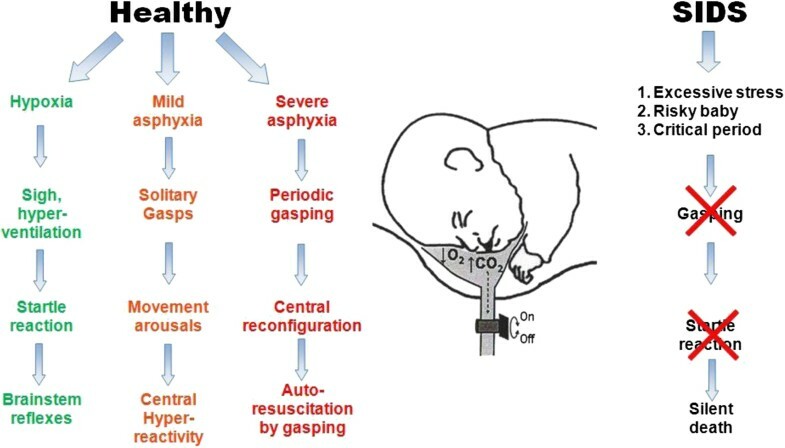 Cardio-respiratory changes in anaesthetized catduring asphyxia caused by inhalation of CO2 and resuscitation byAspR provoked by mechanical stimulation of nasopharynx (NPh). Recordings, fromabove: ECGII- electrocardiogram, BPfa- blood pressure infemoral artery, Ppl – pleural pressure, V´ –tracheal airflow, VT – tidal volume, Sig. – signal foradministration of CO2 or stimulation of nasopharynx, x –continuation of recording, t – time indicated in intervals of5 seconds. Reproduced with permission and modified from . The cough reflex induced by stimulation of various airway receptors,held as a “watchdog of the lung” consists of 3 phases. After the initialdeep inspiration (DI) there is a rapid compressive phase with glottalclosure, followed by strong expulsion of the enlarged lung volume [21, 22, 31, 40, 41]. 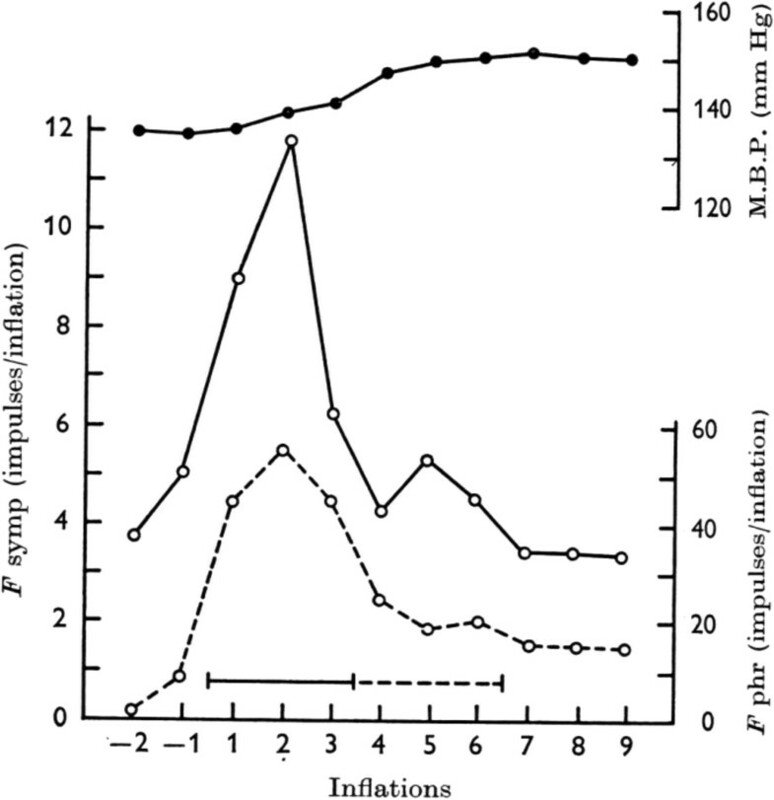 The graduallyincreasing lung volume stimulates the SARs, and via the Hering- Breuer inflationreflex (HBIR) tends to inhibite adequately the progressive inspiration similarly asin eupnoea. The expiratory effort is very strong at the beginning of the expiratoryphase of CR due to Hering Breuer expiratory facilitation reflex (HBEFR), caused byenlarged lung volume . Therefore, thedeeper the initial DI, the more powerful or effective is usually the subsequentexpiratory effort. During a series of cough efforts persisting after the endof stimulation, their intensity gradually decreases with the lowering of lung volume,ventilatory drive, peak expiratory flow, and with prolongation of the secondnon-active part of the expiratory phase of cough. 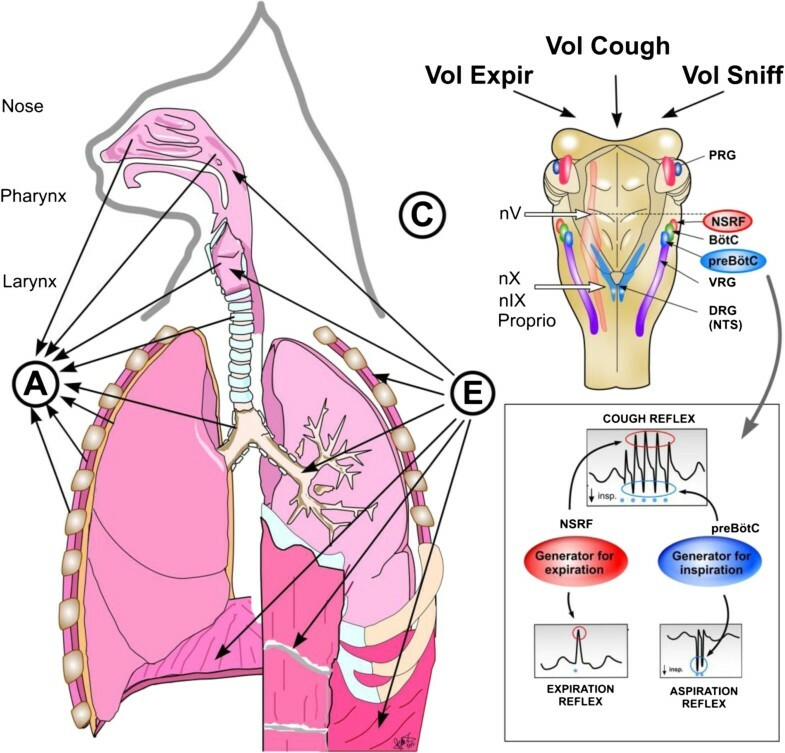 In non-paralyzed subjects, themyotatic reflexes of the respiratory muscles and stimulation of various thoracic andabdominal proprioceptors, as well as irritant RARs and C fibres in the airways andlungs, caused by flow and volume changes, can also contribute to the modification ofthe successive cough efforts [31, 41]. Somato-sensory nerves innervating the chest wall, D andabdominal muscles, as well as nerves of visceral organs also likely play importantrole in regulating cough . Cough is not astereotyped output from the medullary “cough center”, but itspattern and strength depend on many afferent inputs on the “cough center”. Experiments in paralyzed cats indicated close functional connectivity ofventro-lateral medullary neurons with phrenic, lumbar and recurrent laryngeal nervesduring fictive coughing, induced by mechanical stimulation of theintrathoracic trachea. During the inspiratory phase, excitation of medullaryinspiratory augmenting (IAug) neurons, are connected with activation of phrenic andrecurrent laryngeal nerves. In expiratory phase, the activity of expiratoryaugmenting (EAug) neurons, are accompanied by activation of the lumbar and laryngealnerves . The CPG undergoesreconfiguration to produce cough. About 1/3 of medullary inspiratorydecrementing (IDec) neurons of the caudal ventral respiratory column (cVRC),during the first cycle (C1) of cough attack changes to IAug type. This isaccompanied by increases of phrenic activity, esophageal pressure and the inspiratoryphase duration. Coughing is a rhythmic process persisting also after the ending ofstimulation, with lower intensity and prolongation. 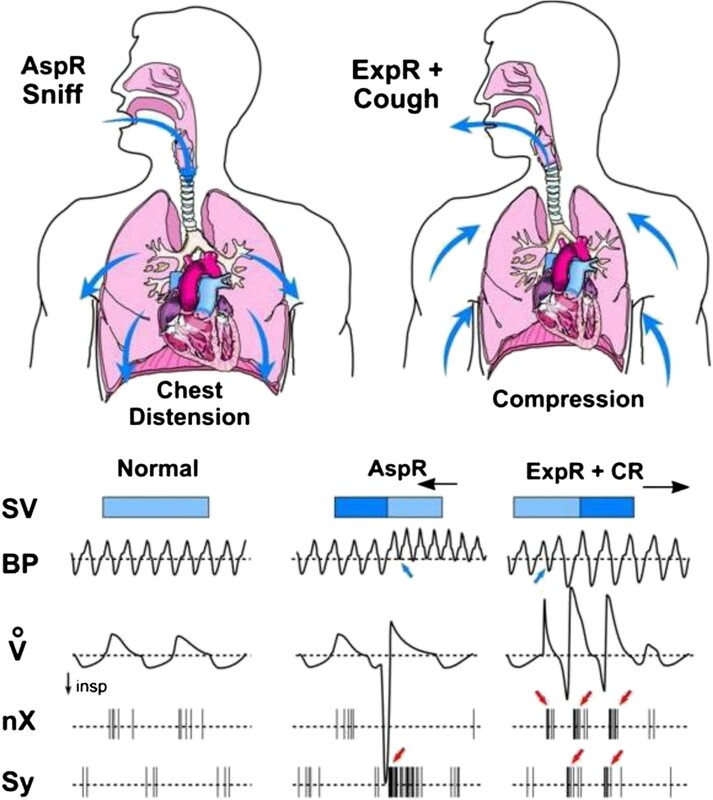 AspR and ExpR are solitarynon-rhythmic respiratory processes and for their short durations they often do notdisturbe the fictive cough attack [27, 44, 45]. Also prevention ofproprioceptive reflexes in paralyzed animals eliminates some modification effects ofairway reflexes, described in anaesthetized non-paralyzed animals [31, 46] and their model, or chronic cough in patients[48, 49]. The expiration reflex induced by stimulation of the larynx ischaracterized by laryngo-constriction and prompt powerful expiratory effort withoutany inspiratory increase of actual lung volume [50, 51]. The ExpR supports the CR toprotect the airways and lungs from airborne and inhaled pathogens, allergens,aspirate and other irritants. Acute and chronic cough is a frequent symptom ofrespiratory tract irritations and disease, such as gastro - oesophageal refluxdisease, asthma and COPD in humans .Aspiration of pathogens present in foreign materials or secretions into the lungs,represents the most dangerous complication in patients with acute stroke,Parkinson’s disease, comatose states, long-term invasive artificialventilation, nasogastric feeding, recurrent respiratory infections and dysphagia,resulting in aspiration pneumonia, particularly in the elderly[48, 52–54]. Foreign materials and secretescontaining viruses can be ejected by a strong expiratory effort up to 9 meters, and apatient can infect many co-passengers during airplane travel and can disseminateinfluenza and other respiratory infections to various destinations. Feeding through anasogastric tube offers only limited protection against aspiration pneumonia,developing already after few days of illness in patients with dysphagia after acutestroke . This may result from unwantedreflex aspiration provoked by nasopharyngeal stimulation with the catheter.Therefore, the down- and up- regulation of CR and ExpR may have a very positive, bothpreventive and therapeutic effects in patients. Testing the efficacy of CR in variouspathological conditions can be useful for the assessment of the risk, as well asprevention and treatment of aspiration pneumonia[53–55].Particularly the ExpR induced from the larynx, accompanied by glottal closure, is themain reflex that prevents aspiration [54, 55]. Reliable ambulatory counter for cough have beendeveloped for evaluation of cough count and intensity. Together with self-scoringevaluation of cough severity and impact on quality of life, it can be useful fordiagnostic and antitussive therapy .Similar short reflex expirations (ExpR) can be induced also by mechanical stimulationof the trachea in anaesthetized cats . In defensive airway behaviours the laryngeal motoneurons are multifunctional in cats.During fictive CR the inspiratory laryngeal motoneurons (ILM) and expiratorylaryngeal motoneurons (ELM), responsible for successive glottal dilation, closure,opening, and narrowing are active, parallel with the phrenic (PHR) or abdominal (ABD)motoneurons, contributing to the inspiratory or expiratory phase of CR, respectively.During the fictive AspR there is a strong activation not only of the PHR butalso the ILM controlling the glottal dilators, and also the styloglossus muscle,providing tongue-back elevation. These activities provide an explosive inspiratoryairflow during the AspR . According to arecent computational biomechanical model many components of theraphe’-ponto-medullary system participate in the realization of the CR. Thismodel based on successive transsections in rats and complementary calculations using64 equations, resembles in vivo conditions. The DI caused by activation of PHR isaccompanied by glottal dilation, provided by ILM. The expiratory phase of CR startsby activation of ELM and ABD motoneurons for glottal closure and production of strongexpiratory effort, followed by activation of both ILM responsible for glottalopening, and ABD motoneurons providing rapid expiratory airflow. The intensity ofsecond and further cough efforts gradually decreases, because of inactivation ofhigh-pressure ILM, connected with successive lowering of peak lung volume, peakalveolar pressure, peak abdominal pressure and drive, resulting in lower peakexpiratory flow . Gradual transsection experiments in 4 weak old rats indicated, that therespiratory CPG has 3 rhythmogenic capabilities, realized by variousneurons in 3 interacting structures. The intact ponto-medullary complex producesa three-phase rhythm, consisting of inspiration, post-inspiration andexpiration. After elimination of the pons the PreBötC and the BötC of themedullary complex produce a two-phase rhythm, consisting from inspirationand expiration. After elimination of BötC the remaining PreBötC(proposed to be a “kernel” of respiratory rhythmogenesis), together withthe rostral Ventral Respiratory Column (rVRC) produces one-phase rhythm of rarersolitary inspirations, influenced by hypercapnia , resembling gasping respiration. A new computational model indicates that the regulation of respiratory rate andbreathing pattern, provided by brainstem respiratory network, can be substantiallyinfluenced also by pulmonary and pontine feedback loops . Similar model would be very useful for explanation ofreconfiguration of breathing control by AspR during the stage of premortal gaspingrespiration, often resulting from asphyxia and providing autoresuscitation in bothanimals  and infants . Mechanical stimulation of the NPh provokes AspRnot only in severe hypoxia, manifesting by gasping, but also during eupnoea. The verysimilar character of AspR and gasping suggests that AspR transiently suppresses thebrainstem mechanism responsible for neurogenesis of eupnoea, and activates those forgasping. The intensity of repeated AspR-es and accompanying inspiratory processesdecrease only for ~4 cycles, but rapidly normalizes . This special ability might allow use of AspR forexperimental and model studies of autoresuscitation in general. It would be useful toexplain the mechanism of reconfiguration of CPG provoking AspR by simple NPhstimulation, even in the stage of premortal gasping respiration in cats. Practical application of powerfulresuscitation potential of AspR in animals [19, 31, 35], and variousrevitalisation effects of its voluntary surrogate, represented by sniff in humans, seem to be very perspective. Recording of the activity of respiratory muscles and their neural connections, thepleural pressure and airflow parallely with BP and electrocardiogram (ECG), allowsevaluation of the cardio-respiratory functions and their control mechanisms. They mayreflect the character of pertinent changes in various vital functions, influencingthe general state of the organism. The results of our systematic study indicated,that airway reflexes and particularly the AspR have similar resuscitation potentialin animals as autoresuscitation by gasping. In patients with chronic heart failurehypoxia and not the frequency of apnoeic episodes causes the acute haemodynamicstress . Hypoxia frequently causes lifethreatening nocturnal cardiac arrhythmias, which correlate with the severity of sleepapnoea , usually treated in patients withcontinuous positive airway pressure (CPAP). Hypoxic apnoea in cats, however, can bereversed by application of negative or even positive pressure or flow to isolated UA as was indicated in Figure 3. This procedure provokes SIs of varying intensity, accompaniedusually by normalization of pathological cardiovascular activity(increase in HR and BP in collapsible states). This is followed by gradual reversalof cortical activity and recovery of spontaneous breathing [18, 19]. Figure 4 illustrates that a very rapid and strong activity of the phrenic nerve,induced by stimulation of NPh in cats, responsible for the rapid and largeinspiratory flow and volume of AspR, is accompanied by a strong activation of thesympathetic efferent fibers. This results in reflex tachycardia and severevasoconstriction, causing a marked hypertensive reaction in paralyzed cats, demonstrating the revitalizationeffects of AspR. Reaction of the phrenic and sympathetic nerve fibers and mean blood pressureon NPh stimulation in paralyzed cat. Response of phrenic (--o--) andsympathetic (─o─) efferent fibres and of mean blood pressure(▬●▬) on nasopharyngeal stimulation averaged from fiveexperiments on three fibre preparations in one paralyzed cat during artificialventilation. Continuous line - common stimulation period in all experiments,interrupted line - stimulation finished in some experiments). Reproduced withpermission from . Similar vasomotor reflexes can be provoked easily also by stimulation of coldreceptors of the face and upper airways. Apnoea and bradycardia, followed usually bydeep inspiration, peripheral vasoconstriction, and a systemic hypertensive reactionwith redistribution of the blood to vital organs, are the main effects of thisdiving reflex. Stimulation of the orbito-frontal region of the face withcold water of 5°C for 5 s, reversed a supra-ventricular tachycardia from300/min to 120/min in a neonate . Thediving reflex has a strong sympathetic component accompanying DI, in addition toother effects. Therefore, it proved to be very useful as a basic life support undercollapsible states, to postpone and/or prevent an imminent loss of consciousness anda subsequent ischemic-hypoxic brain damage. From various methods of therapeutichypothermia, widely used in polytraumatic patients the NPh balloon technique provedto be very effective . In addition todirect cooling of caudal brain structures, also the NPh cold and mechanoreceptorstimulation may participate in the strong cerebral vasoconstriction, preventingischemic and hypoxic brain damages. Figure 3 illustrates a powerful resuscitation effect ofAspR in a cat. 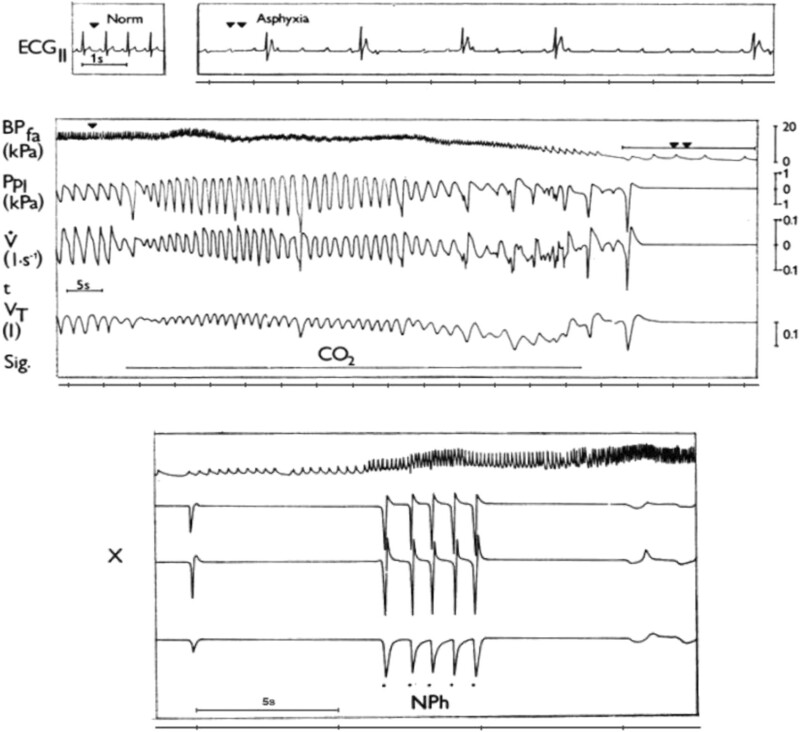 Inhalation of CO2 after reactive transient hyperventilationevoked a gradual development of asphyxia and cardio-respiratory failure. Itmanifested by SIs and asphyxia culminating in apnoea, followed by repeated gasps. Theasphyxia provoked severe bradycardia and extreme hypotension, accompanied by aprogressive development of A-V blockade. In this agonal state each contactstimulation of the NPh mucosa elicited AspR-es, which were even stronger than thepreceding repeated gasps and resulted in cardio-respiratoryresuscitation. Similarinteresting case report published in 1991 indicated, that a present paroxysmalsupraventricular tachycardia was terminated during introduction of a nasogastriccatheter for gastric juice collection in a patient . Recently, NPh aspiration by a catheter proved to be atreatment option for supraventricular paroxysmal arrhythmia in infants . Clinical observations indicate, that alsohiccough attacks can be easily terminated by introduction of a NPhcatheter in patients . Voluntary“coughing on demand”, proposed by Criley et al. is frequently used for preventionand treatment of anaphylactic collapse, occurring during functional magneticresonance (FMR) examination and in other collapsible states. Mechanical stimulations of NPh by a nylon fibre through a pharyngostomic opening, inanaesthetized adult rats also evoked SIs, very similar to AspR of cats. Theywere characterized by increase in tidal volume, airflow and minute volume, comparedto control breaths. Such AspR-es provoked by mechanical stimulations, repeated incycles of 16 s, significantly decreased the higher HR and the number ofextrasystoles, caused by intraperitoneal application of aconitin . AspR has various powerful normalization andrestorative effects, which can inhibit different spastic events, such asbronchoconstriction and laryngospasm, as well as interrupts hypoxic apnoea, andinhibits the number and intensity of the cough efforts, at least in cats. Therefore,AspR as a model of SIs alone or combined with forced expiration(ExpR) or prompt cough effort (without preceding inspiration), canserve for reversal of many functional disorders, as indicated in our recent review. The main effects of AspR, ExpRand CR are schematically illustrated in Figure 5. 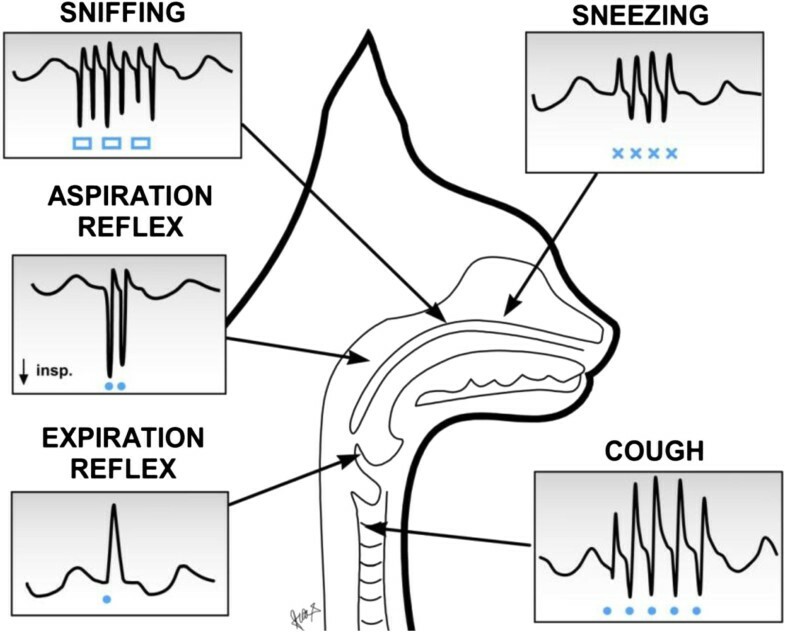 Schematic illustration of the main effects of aspiration, expiration andcough reflexes in cats. Compared to normal values, the sniff-likeaspiration reflex (AspR), provoked by nasopharyngeal stimulationand characterized by rapid and strong gasp-like inspiratory flow (V’),manifests with distension of the chest and dilation of the cardiac cavities.This causes a decrease in the systolic volume (SV), due to retention of theblood in the heart. There is also a very strong activation of the sympatheticnerve (Sy), causing an increase in the blood pressure (BP) and a decrease invagal activity (nX). On the contrary, the expiration reflex (ExpR),characterized by rapid and strong expiratory effort, manifesting with chestcompression, which increases the next SV and BP and has a strong vagotoniceffect. The cough reflex (CR) has even stronger effects than the ExpR,due to its deep inspiratory phase, adequately strengthening the successiveexpiratory effort. In addition, the preparatory initial inspiratory phase ofcough is accompanied by a sympathetic activation, resulting in an increase inBP. Combined from results of our earlier publications [18, 22, 31, 40]. The three analyzed airway reflexes very strongly activate the brainstem CPG ofbreathing, effectively modifying the “central mechanisms” of variousvital functions by direct reflex action , or mediated by dense synaptic connections and variousmediators . Figure 6 schematically illustrates the reflex arch and central mechanisms ofAspR, ExpR and CR. The effects of airway reflexes may promote normalization of hypo-and hyper-functional disorders, if not hindered by a presence of severe or fixedchanges (e.g., acute stroke or recent myocardial infarction), both in animalexperiments and probably also in human studies. AspR and ExpR incats reversed several life-threatening disorders of functional character, manifestingas hypoxic apnoea termination and cardio-pulmonary-cerebral-resuscitation (CPCR)[19, 31].Therefore, the powerful AspR might influence positively also the disbalance betweenthe excitatory and inhibitory cardio-respiratory impulses, deciding for survival ordeath in the patho-mechanism of SIDS, according to the hypothesis of Leiter andBöhm . The powerful stimulatoryeffect of AspR, therefore, might support the survival of dying animals, as wellas SIDS infants and adult patients, particularly in emergency situations andwhen there is no immediate health-care service on site. This effect results in adecrease of the number and intensity of disturbing cough efforts in anaesthetizedcats . In addition to strong gasp-likeinspirations provoked by NPh mechanical stimulation, mediated by brainstem centralcontrol mechanisms participating in gasping, AspR is characterized also by reciprocalinhibition of expiratory activity. Reflex arch and mechanisms of AspR, ExpR and CR and their voluntarycounterparts. Schematic illustration of the reflex arch and mechanismsof AspR, ExpR and CR and their voluntary counterparts. A- afferent roots: viatrigeminal nerve from the upper part of nasal cavity for sniffing, via n.glosso-pharyngicus from the nasopharynx for AspR, via n. laryngicus sup. fromthe larynx for ExpR and via n. vagus from tracheal-bronchial region andproprioceptive afferents for CR. E- efferent roots: to inspiratory muscles(diaphragm and external intercostals) and to expiratory muscles (abdominal andinternal intercostals) for ExpR and CR. C- central structures: “Generatorfor inspiration” in pre-Bötzinger complex for AspR, “generatorfor expiration” in NSRF- nucleus sub-retro-facialis for ExpR, and bothgenerators for CR. Breathing manoeuvres allow voluntary performance of allthree reflexes (voluntary sniffs, prompt expiration and sniff followed bystrong expiration), reproduced with permission from our review . Stimulation of the larynx both in cats and humans strongly activates the higherlocated brainstem expiratory mechanisms, causing laryngo-constriction and promptexpiratory effort without preceding inspiration. Similar short reflex expirations canbe elicited also by tracheal stimulation in anaesthetized cats . These efforts prevent intrusion of irritantmaterials and secretions into the lungs and provide their expulsion. Stimulation ofthe trachea-bronchial mucous membrane activates both the inspiratory and expiratorycentral mechanisms, provoking DI followed by powerful expiratory effort. The DI of CRprovides venous return to the heart, and the successive strong expiratory effortsupports brain perfusion, preventing and/or terminating various collapsible states. Such “on demand”provocations of CR might be very useful for study of CPCR in modelexperiments with dysrhythmias, including VF, particularly in animals, but supposedlyalso in clinical studies. Recent results indicate that already spontaneous gaspsrestored the cerebral blood flow (CBF) to 59% of the control values in animals. Therewas a very significant correlation of the CBF with the decreases in intrathoracicpressure during the inspiratory phase of gasps and with the increases of aorticpressure during their expiratory phase. Spontaneous gasps producing significantincreases in the CBF during untreated cardiac arrest, confirmed the beneficialresuscitative effect of gasping during the cardiac arrest . Experiences obtained in studies with CR in animals haverelevance for human cough research . Thegradual decrease in intensity of successive cough efforts can be explained by HBEFR,which is very strong at the beginning of the expiratory period, reflecting themomentary relatively large lung volume . Longer-lasting asphyxia may result in gradual decompensation of separate vitalfunctions in general. Severe inspiratory resistive loading induces cardio-respiratoryfailure and not just an initial respiratory decompensation in anaesthetized rats. A reduced respiratory activityresults in increased ventilatory drive and evokes an inactivity inducedrespiratory facilitation with gradual restoration of breathing. Suchbreathing efforts were connected with an increase of mean BP, which proved to be theprincipal compensating factor in response to this cardio-respiratory failure, andsupported generation of peak tracheal pressure [74, 75]. Respiratory facilitationmanifests also after spinal cord injury as crossed phrenic phenomenon . Similar complex cardiovascular effects ofresuscitation provided the required blood pressure increase, which started thereversal of cardio-respiratory failure, induced by severe hypoxia also inanaesthetized cats . Similar facilitationwas observed also during experimental VF in anaesthetized sheeps. Previousreflectoric movements of limbs caused that the thoraco-abdominal pump persisted tofunction for about 2 minutes in spite of total cardiac arrest, and causedsynchronous changes in BP . Coughingcomprising initial DI, can allow both the maintenance of the venous return to theheart as well as brain perfusion, at least several minutes, which is sufficient forpersistence of wakefulness, if needed. Therefore, voluntary rapid SIs each followedby prompt forced expiration (ExpR), might provide a powerful potential forcardio-pulmonary- cerebral resuscitation particularly in syncopal states,various collapses and even for prevention of sudden cardiac arrest [31, 40]. Application of airwayreflexes proved to reverse pathological situations (in animals 7 disorders) and (inhumans 11 disorders), including asthma [78, 79], indicated in a Table 1. However, there are still many open questions in this importanttopic. Viliam Donic, Roman Benacka, Jan Jakus and Sona Gresova are co-authors. The implementation of experiences obtained during the complex study of airwayreflexes summarized in a concentrated form in this review was possible by closecooperation with prof. emeritus Imrich Ivanco MD, PhD and late prof. Juraj Korpas,MD, DrSc. at the Faculty of Medicine PJ Safarik University, Kosice, Slovakia andlater with Juraj Korpas, Prof. Jan Jakus, MD, DrSc, Prof. Kamil Javorka, MD, DrSc andothers at the Jessenius Faculty of Medicine in Martin, Comenius University,Bratislava, Slovakia, as well as with late prof. John G. Widdicombe from OxfordUniversity during one year sabbatical study state, granted by Welcome Foundation, andlater at London University, UK. Many thanks for their valuable collegial cooperation.We thank Ing. Martin Kundrík and Assist. prof. Maria Pallayova, MD, PhD fortechnical help with preparation of the manuscript. The research was supported andapproved by Slovak Grant Agency for Research (APVV) No. 20.047705 and No.0189–11, as well as COST action B26. The Ethical committees of the Faculty ofMedicine, PJ Safarik University and of the University Hospital, Kosice, and of theJessenius Faculty of Medicine in Martin, Slovakia gave a written consent to theanalyzed research activities. Zoltan Tomori and Viliam Donic were consultants of Nasophlex Slovakia, s.r.o. fromJanuary 2007 for testing of some effects of airway reflexes, which are in progress withuse of 3 patent applications of a resuscitation device stimulating noninvasively thenasopharynx, sensitive points of the nasal filter and the external ear in sleep apnoeapatients. All authors declare that they have no competing interests with the preparationof this paper. The patent “Resuscitation device and method forresuscitation” was approved for Australia no: 2006351860, for Canada no:2,672,731, for Europe no: 12167089.3-2305, in progress for USA no: 2010/0042179 A1, andInternational no: WO 2008/072948-A1. ZT developed the design of the experiments and the manuscript and VD, RB, SG and JJequally helped him to study the mechanisms of the cough, aspiration and expirationreflexes and to complete the manuscript. All authors read and approved the finalmanuscript and informed the corresponding author with their consent.